When I read Doug Greene’s brilliant biography of John Dickson Carr, The Man Who Explained Miracles (my library seriously runs the risk of not getting its copy back one of these days), I also looked in the appendices, which included a comprehensive list of works authored by Carr. In this list, Greene also devoted a section to parodies of Carr, and one title caught my eye: Hocus Pocus at Drumis Tree by Norma Schier. I was intrigued by the idea of parodying Carr while making the names anagrams—“Drumis Tree”, for instance, is a clever anagram of “Murder Site”. Unfortunately, fellow blogger TomCat (a.k.a. LastCenturyDetective) already jumped the gun on this one and recently reviewed The Anagram Detectives in an excellent post over on his blog, Detection by Moonlight. So, the day after introducing my general formula for reviewing short story collections, I’m going to deviate slightly from it to make my review a little different. (Whoah, I’ve done four reviews in four days now!!!) I will focus here on pastiches in this collection of the authors I am familiar with, look at the other stories quickly, and then look at the collection in general. We’re in for quite a ride, so let’s get started! A neat little touch by Norma Schier is that the “author” of each story is an anagram of the author she is poking fun at— in this case, it is none other than the revered Sir Arthur Conan Doyle! Yes, Sherlock Holmes is first to get the anagram treatment, as Hoskell Chomers and his partner Sandwort investigate the disappearance of a newlywed woman’s husband. The deductions made here are absolutely spot on, and Schier just brilliantly captures the Holmes/Watson relationship, with the traditional opening scene (“I see that [insert deduction here], Watson…”) and a really good solution to the mystery. If you unscrambled the anagrams, you would have one of the best Holmes pastiches I’ve ever read. Excellent work! “Norma Haigs” is really an anagram of Ngaio Marsh, and If Hangman Threads is itself a tricky little anagram, all while managing to sound like an actual Marsh title! Actually, that’s what I’m most qualified to talk about here— the titles Marsh came up with. I’ve only read one of her works to date, the very good Off With His Head (aka Death of a Fool), which involved an impossible decapitation during a performance of a traditional folk dance, right in front of an entire audience! Marsh struck me as a clever author, and I liked her, and from what I can remember, this pastiche is a pretty good tribute to her style. It involves the mysterious appearance of a corpse at an art show— plenty of fun for all! “Cathie Hag Star” is none other than that Queen of Crime: the one, the only, Agatha Christie! This pastiche is spot-on, as the brilliant Frenchman Pierre Choulot and his rather dim-witted friend Stangish are driving through the countryside, only to have their car break down just outside of the quaint little village of Teccomeshire Fen. Choulot and Stangish are perfect clones of Hercule Poirot and his friend Hastings— Choulot in particular is great, with his outrageous butchery of English idioms, occasional French exclamation, and bizarre mannerisms. Of course, it’s only a matter of time before they find a body, as a fellow who liked to paint is found dead. Not to fear, Pierre Choulot is on the case, brilliantly interpreting some clues that could easily have been overlooked by the reader— a spot-on tribute to Christie at her best! Oh, Lordloveaduck, this story is wonderful! It is a brilliant take on my favourite mystery author of all-time, the inimitable John Dickson Carr. In particular, it is a parody of Carr’s Sir Henry Merrivale tales. The detective, Sir Marvin Rhyerlee, is a perfect recreation of H.M., who “allows himself to be mollified” and calls himself “the Old Man”, but who insists that nobody treats him with respect, and everyone laughs at him behind his back. The entire story delightfully captures the Carrian style, with an American visitor in England, a spontaneous (and quite happy) romance, and (of all things) a clever impossible crime!!! At Drumis Tree, a nice little restaurant, “murder most foul” occurs, as a man sips some champagne and slumps over on the spot, dead! But here’s where things get tricky— nobody slipped anything into the glasses, and the victim, just before dying, switched his glass with the young lady sitting next to him! Our protagonist notices the un-chivalrous conduct of the party, which almost unanimously suspects the young lady of the murder, and appeals to Sir Marvin to solve the crime, which he does, in grand style! This is a very fun take on Dorothy L. Sayers, involving the brilliant amateur aristocrat sleuth, Sir Ordway Temple, who is riding in a car with his wife and manservant (and some very fine port). He suddenly stops the car (which causes the manservant some moments of worry about the port) to investigate a car wreck— and finds an old woman inside, dead, stabbed through the chest! It is a very fun take on Sayers, and takes delight in playfully mocking her detective, Lord Peter Wimsey. It manages to be a decent mystery, and contains a good reference to an actual Sayers title in its title. This excellent story takes place at a college, where one of the faculty is discovered at the newly-installed archery range, with a poisoned arrow through his chest. 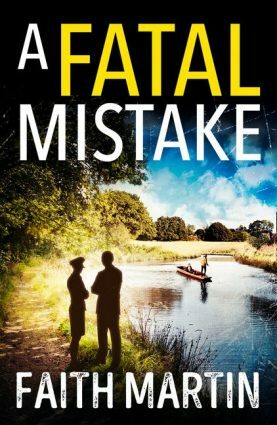 It is an excellent take on Michael Innes, perfectly capturing his style, and manages to be a good mystery, where good ol’ Bill Shakespeare helps our detective solve the crime. When it comes to anagrams, there is one absolutely brilliant anagram I couldn’t solve at all, and when the answer was revealed, I could only stare with awe. The interesting thing about this take on Rex Stout is that it doesn’t quite capture the voice of Archie, but it perfectly captures the voice of Nero Wolfe! Or, should I say, it captures the voice of Owen Foler, but not Woodie Charing? In any case, the services of Foler are engaged by a man who is frightened that someone in his family is plotting to kill him. He asks Foler to come to his house to stop the criminal from succeeding, but Foler refuses to budge, sending Woodie to the house to collect the suspects and bring them to Foler’s office. Unfortunately, there’s a bit of a delay when a corpse pops up in the house and the police have to be summoned… Overall, it’s a very fun little story. Ah, Clayton Rawson… I’m afraid that after his masterpiece, Death From a Top Hat, his works descended slowly but surely into madness. The last book of his that I read, The Headless Lady, was a very poor book overall, with a collection of clichés as old as the sun, an uninteresting mystery that didn’t involve an impossible crime, and only a few good ideas and scenes, buried among the very generic and very boring material. The Weapon from Nowhere seems to understand Rawson’s strengths and weaknesses, and the result is an entertaining story with an impossible situation, with a solution that’s a bit of a letdown, but to be fair, it’s how Rawson’s plotting might have worked. The story involves Maître Glenthier (The Great Merlini), who with his journalist friend goes to the house of a woman who predicts death at ten o’clock. Sure enough, at ten, the clock strikes, a gunshot sounds, and a man lies dead with a knife in his chest! The solution is a letdown, but the story overall is fun enough. Yes, this is a pastiche of the great G. K. Chesterton, whose creation, Father Brown, is one of the most loved detectives of all-time. It’s somewhat disappointing, really, that Schier doesn’t go for paradoxes, which Father Brown is famous for, but the story is an excellent one. It’s a highly creative tale about an ancient painting which turns anyone who looks at it into stone. Brother Faneworth soon lays the ghosts to rest in this charming story I liked very much. Now, let’s take a quick look at parodies of authors I am unfamiliar with, and therefore, could not comment on. “The Object Lesson by W.H. Geurnon” is a take on E. W. Hornung, with a gentleman thief and his companion resolving to steal diamonds from a nasty old lady who needs a little lesson in manners. It’s an enjoyable tale in which everything that could go wrong for our heroes does. “Mr. Copable, Criminologist by Amy M. Graingerhall” is a take on Margery Allingham and her detective, Albert Campion. I’ve never read Allingham, but this story is a very fun one, involving a simple, persuasive, and workable solution to an impossible theft. “F as in Fraud by Walter Cantree” is a take on Lawrence Treat, who was apparently a noted author of police procedurals. It was an O.K. story, but I entirely missed out on the layer of pastiche and parody I had with the other authors. Finally, “The Adventure of the Boing! Ritual by Rif H. Lobster” is a parody of the Schlock Holmes tales by Robert L. Fish. In all of Schier’s other stories, all the proper names are anagrams, but here, there are plenty of puns made possible without an anagram or two. Apart from that, I reveal nothing— this is a mad, and wildly funny, story, which proves that it is possible to parody a parody!!! Overall, The Anagram Detectives is a delightful short story collection. Every short story here is enjoyable, which is a real rarity. Even if you are unfamiliar with the author in question, you will most likely enjoy the story. In addition, Schier plays diabolically fair with her anagrams, challenging to reader to solve them before she divulges the answers. I decided to attempt solving the anagrams story by story, and averaging my results, I got a final score of 68.8%. Even with a rather low score, it was an extremely entertaining evening! 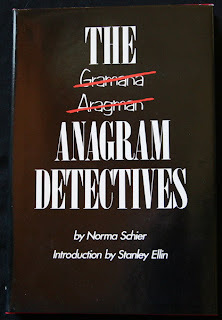 As a final note, my copy of The Anagram Detectives was purchased online, and I chose the copy I ended up choosing because I wanted copy in good condition with a dust jacket for once. 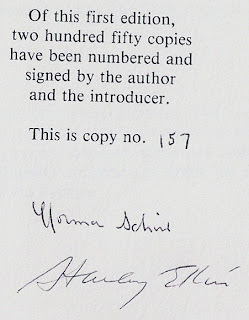 It was with great surprise then, when I discovered that my copy of the book was autographed, not only by Norma Schier, but also by Stanley Ellin, who introduced the stories! Ellin’s introduction was very humorous, and one of the best I’ve read in a while, as he recounts his linguistic adventures, including a granddaughter who delights in pummelling grandpa in Junior Scrabble. 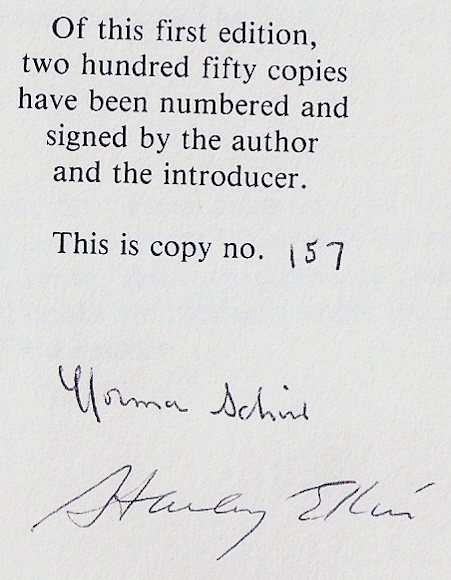 Only a mad genius could come up with the stories in this volume; it’s such a wonderful feeling to know that a mad genius and an excellent introducer both handled this volume for at least a few brief moments, and left two signatures there. The book is now a prize item in my humble collection (instead of residing in my to-be-read pile, which has gained alarming proportions). This collection really is unique, not only in the highly amusing manner in which its pokes fun at some of the big names of the genre, but also that none of the stories can be labeled as bad – no mean feat for a collecting consisting of 14 stories from one and the same author. It's also difficult to pick a definite favorite. I'm tempted to nominate the delightful opening story, that perfectly captured and parodied Sherlock Holmes and Dr. Watson, but the same is true for the Agatha Christie and Michael Innes pastiches, and I actually liked Schier's take on A.J. Raffles and Albert Campion better than the originals! Heck, there's even much to say in favor of the Rawson story, the only that came close to be being disappointing, since it's a spot-on caricature of his plotting technique. I think this really is a book deserving of the title, "a modern classic," and I wish more modern writers would take her example and have some fun with the form. I entirely agree that it deserves the "modern classic" label. I too am stuck for a favourite- there's the perfect pastiches of Holmes, Christie, Innes, Carr, Sayers... And then A. J. Raffles parody is wonderful to read, even though I've never read the original tales. One thing's for certain: I'm going to keep an eye out for Schlock Holmes from now on!!! I have no idea what you're hinting at in that last sentence, but for the record I want to state that my hands are unsoiled and no burden heavies my conscience – and firmly reject any implication hidden within those vilely structured jumble of words! So... The After House is your next read?